The development of a methodology for retrofit applications to the existing European fleet, so as to increase the pace of technology uptake beyond that governed by newbuilding construction, is the main goal of the pan-industry study known as Atomos IV(advanced technology to optimize maritime operational safety). Besides improved safety, anticipated benefits include the introduction of more human-centered and usable systems, better information access, and faster and more reliable operations. 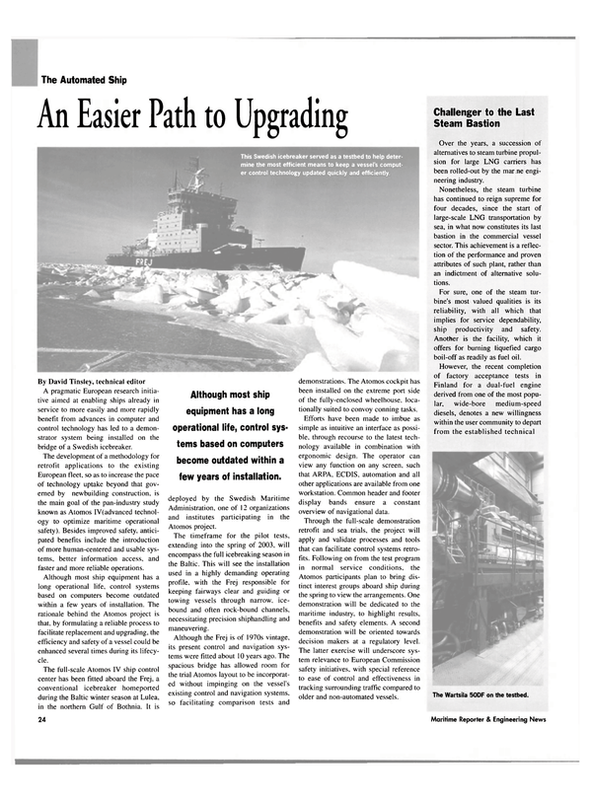 Although most ship equipment has a long operational life, control systems based on computers become outdated within a few years of installation. The rationale behind the Atomos project is that, by formulating a reliable process to facilitate replacement and upgrading, the efficiency and safety of a vessel could be enhanced several times during its lifecycle. The full-scale Atomos IV ship control center has been fitted aboard the Frej, a conventional icebreaker homeported during the Baltic winter season at Lulea, in the northern Gulf of Bothnia. It is deployed by the Swedish Maritime Administration, one of 12 organizations and institutes participating in the Atomos project. Through the full-scale demonstration retrofit and sea trials, the project will apply and validate processes and tools that can facilitate control systems retrofits. Following on from the test program in normal service conditions, the Atomos participants plan to bring distinct interest groups aboard ship during the spring to view the arrangements. One demonstration will be dedicated to the maritime industry, to highlight results, benefits and safety elements. A second demonstration will be oriented towards decision makers at a regulatory level. The latter exercise will underscore system relevance to European Commission safety initiatives, with special reference to ease of control and effectiveness in tracking surrounding traffic compared to older and non-automated vessels.